Make a Wish–I’m the Caretaker. 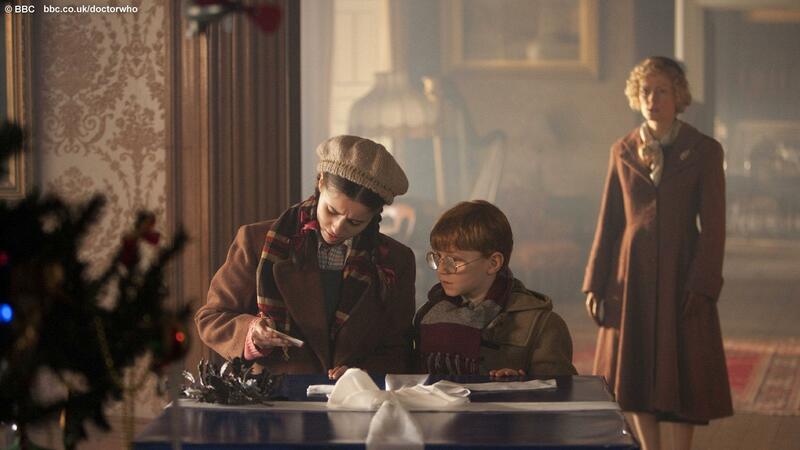 Doctor Who goes Narnia in: The Doctor, the Widow and the Wardrobe. Previously on Doctor Who: The Wedding of River Song. The Doctor, in space, diving after a space suit that he desperately needs, ’cause he’s about to crash into Earth—for which he has to pass into the planet’s atmosphere first, though. Getting dressed in a hurry, then. (How exactly is he breathing…?) Oh, never mind: it’s Christmas! Anyway, he’s made it, and is found by Madge Arwell, a kind woman who tends to bump into things and is got with a pin—when you’ve got a bumbling alien back to front in a space suit, who might possibly an angel, you’ve got a few locks to pick. Except that police box wasn’t the TARDIS, that was just a… police box. How many did they have to try after that, I wonder… Still, the Doctor promises to repay the kindness however he can whenever she needs him—”make a wish,” which is so beautifully Christmassy and Doctory that I’m getting happy goosebumps five minutes in. As it should be. 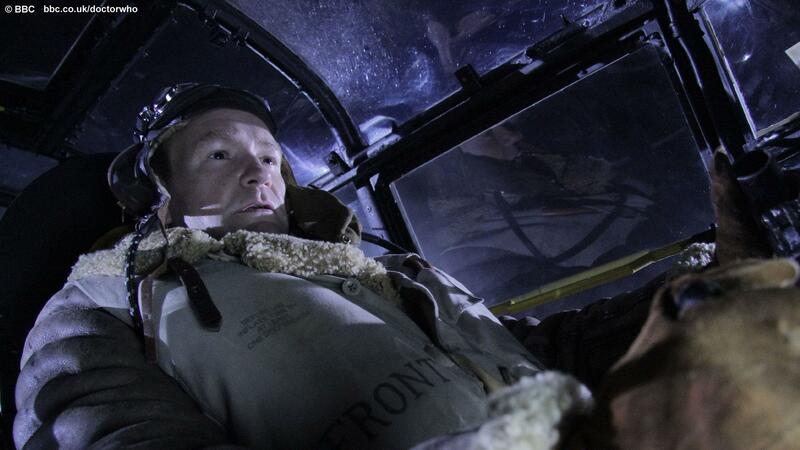 Three years later, Madge’s husband Reg is a pilot in the war who’s not going to make it home for Christmas. Madge and her two children have to find somewhere to stay for the holidays, during the London blitz, I suppose, and, perhaps on a whim, Madge makes a wish. They arrive, on Christmas Eve, outside some rather battered old mansion, with a suitcase each and no idea what to do. 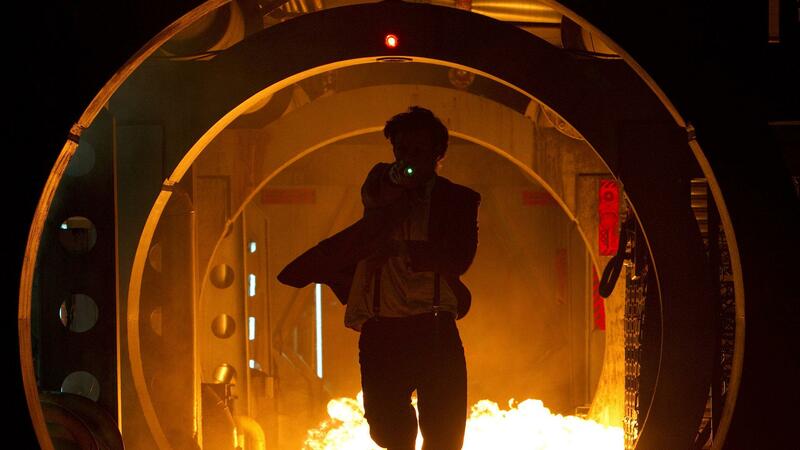 Enter the Doctor. Or the caretaker. Or Get Off This Planet. He’s showing the three round the house and, because he’s the Doctor, an intergalactic five-year-old disguised as a bow-tie wearing alien, you go, ‘Oh, Doctor, what have you done…?’ after about thirty seconds, possibly sooner than that, ’cause, honestly, we should have seen that coming. Armchairs spinning, lemonade tap, beautiful bedroom for Mum, to his credit, and… hammocks. It’s because he’s the caretaker, and the sky might be full of tawdry quirks with a chance of toys going, SQUEAK, he understands. He understands loss, and he understands parents, because he’s been one, he IS one to so many kids he’s helped along the way, all over time and space. And how can you be happy in the face of sadness? Ask the Doctor, make a wish. He’ll show you how. Because, sometimes, just sometimes, he’s more humany-wumany than the rest of us. Then there comes: Narnia. Apparently, the present underneath the Christmas tree opens into another dimension, in which something just hatched. Something either very cute or very dangerous. Or both. Within minutes, the adventure begins, and there a tree aliens, weird, towering structures, space ships, and: Billy Bailey! Bloody hell, it was Christmas just a minute ago! Which is why Madge took a revolver—what’ve you got that for?—before coming to look for her children. Oh, dear. Meanwhile, Lily and the Doctor chase Cyril into a building made of wood, well, disguise wood: trees growing into the shape of a building, making it look like a building, except the Sonic still doesn’t do any bleeding good now. Oh, and he mentions Jade! Fancy him, she did indeed, and she was a looker, too! 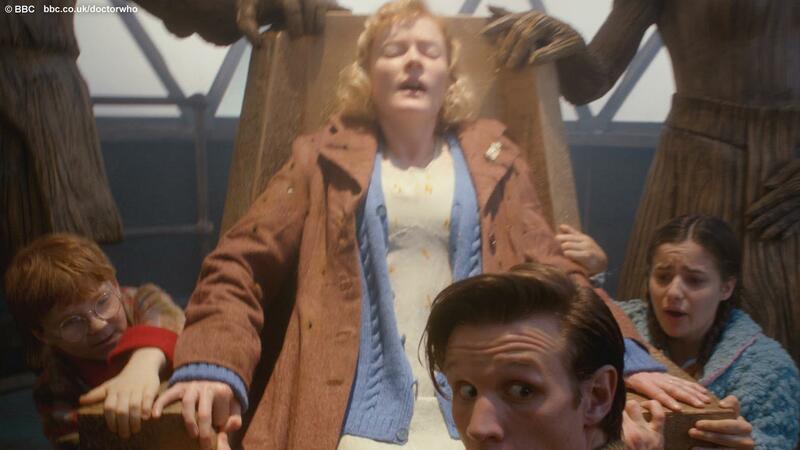 Gave her life for Nine in The End of the World, bless her. When Lily looks out the window, there appears a vista that is only ever talked about in Christmas poems—there’s golden lights sitting atop the Christmas trees, twinkling away. Except it’s not stars, it’s… life force. Eleven is a very alien Doctor, full of that arrogance, that celebration of his alienness; and still a bit stricken by the thought of the very human life that he cannot lead—getting a cab home at two in the morning and all that. He distances himself from all that human emotion that so perfectly encompassed his previous incarnation with sentences exactly like these, as for him it seems like something he can understand and appreciate, but not live for himself. He’s got no home, he’s been ripped out of that sense of belonging somewhere a long time ago—or so he thinks. 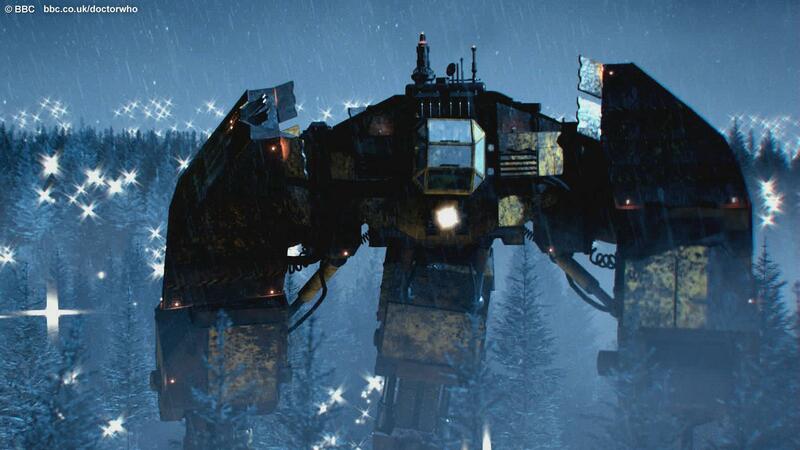 But there’s no time to gaze at the twinkles: the trees are rising, the planet is about to be harvested. Androzani trees, apparently, from the planet that cost Five his life, centuries ago. Some stupid humans, probably, are going to let acid rain onto the planet, which will burn the trees, so they’re trying to escape. For that, the King and Queen have a sort of crown, except it’s not a crown, it’s a relay, and someone strong has to wear so the forest can live in them until the threat is over. The Doctor, as it happens, isn’t strong enough by virtue of being a bloke—they were waiting for someone else: their mothership! Since the three soldiers, including Bill, have been emergency teleported off the planet, Madge has to find a way to come to the rescue—and what better way to do that than to commandeer the Androzani harvester! And now, not Lily is getting the relay—but her mum. Taking a whole planet, a whole forest full of life into her head. Oh, let’s just hope that this is going to work out. Madge has to fly the ship through the Time Vortex, to get the forest somewhere safe and her family back home, which is when tragedy strikes. She hasn’t told her children that their father is dead and now, they have to watch him die as they follow the signal, at which point this reviewer starts writing this through a curtain of tears. Except time can be rewritten, and it wouldn’t be Doctor Who on Christmas, it wouldn’t be the Doctor, if there weren’t a star to light the way, always. Reg made it, he came after the ship—he’s alive! And then the crying doesn’t stop there, because the Doctor’s got friends to see, friends who he thinks think he’s dead, although they don’t, ’cause River told them the truth about the Teselecta (she’s a good girl! ), but never mind, ’cause he’s got the guilty conscience from Hell and Amy’s got a water gun. The Ponds have got a place set for him, because they always do, and they’re not mad at him—and Rory looks older!, well, it’s been two years—and… he’s got a home. Years ago, he told Donna that our daft little planet was the closest thing he had—how far he’s come. For once, he’s got a home, a place where he can always pop in, no matter when, two companions who he’s managed not to screw up (though that, I’m afraid, might yet still happen…). A place where he belongs. His in-laws’, no less. The lonely angel from the stars has found somewhere he can always go, where he can feel that life that he thought he’d lost so long ago, when Gallifrey burnt. Happy crying, Doctor. So humany-wumany. Thoughts of home have always only hurt him with regret and pain, but now he’s got something that is so good that it hurts. 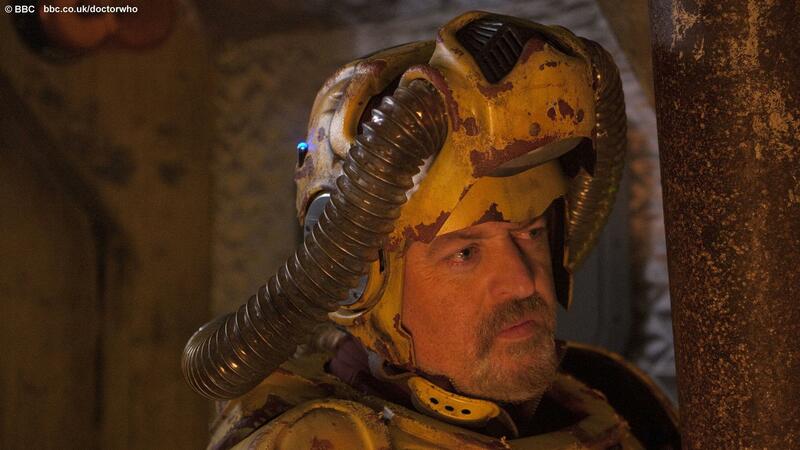 I think this might be the most Christmassy Christmas Special yet—Moffat as outdone himself with the season’s spirit. If you’re lucky, you get to spend Christmas somewhere you feel at home, with people you love to distraction, so much that it hurts, be it family or friends or aliens. It’s supposed to be the happiest time of the year, and it so often isn’t that the times it is, you have to hold on tight and never let that feeling go. 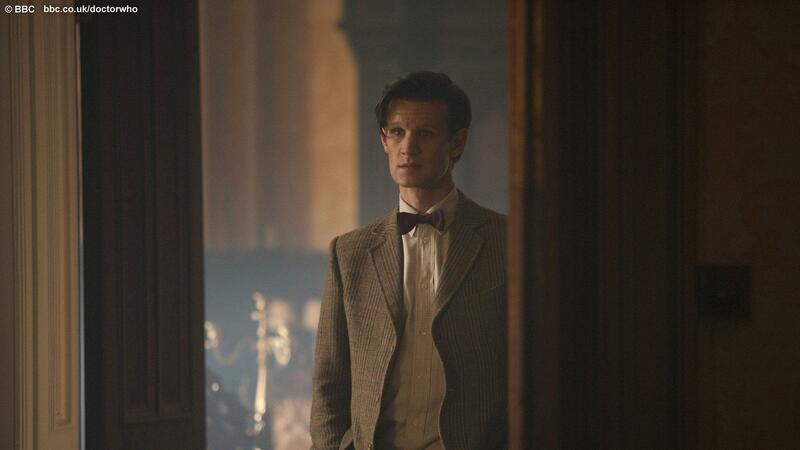 The Doctor will return next year. Until then: hold tight and pretend it’s a plan! I’m sure Moffat’s got one. Next: Asylum of the Daleks. 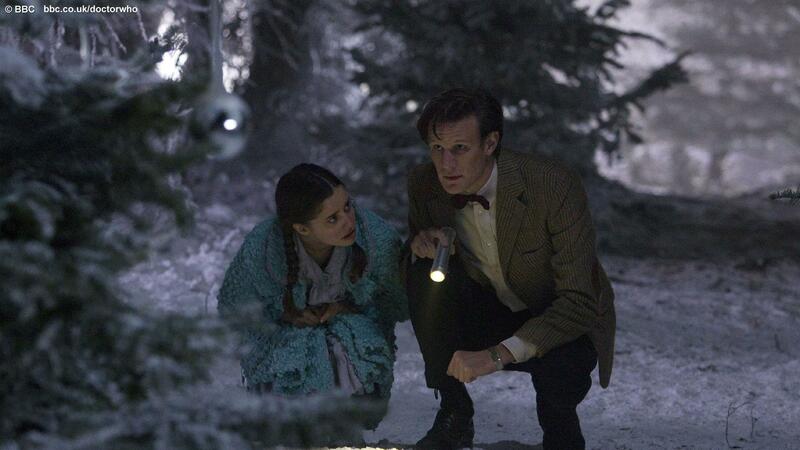 It was definitely a lovely Christmassy episode, full of magic and wonder. But although there were many terrific moments for me – particularly the humour at the beginning and the coda with the Ponds at the end – the middle section was just too bloated (a bit like me after Christmas dinner …). Funny though they were, the Harvest Rangers were just a distraction that slowed the plot down without moving it on enough, and although I don’t expect end-of-the-universe jeopardy in a Christmas special, there just wasn’t enough urgency for me. NextSherlock Holmes, Put Your Trousers On—There’s A Scandal in Belgravia.